Publicly addressing the "strong reasons" given by critics of The Church of Jesus Christ of Latter-day Saints so that their "shame shall be made manifest" (D&C 71:7-8) as well as presenting some evidences for the truthfulness of the LDS Church. I give here a brief outline of the Word of Wisdom for those who would like to understand better this unique Mormon practice. Like many revelations given in the Latter-days, this revelation came in response to a particular situation. Joseph Smith inquired of the Lord to know what to do and received what is recorded in D&C 89. Why the Word of Wisdom? Besides the obvious health concerns that it address, the Word of Wisdom was also given for another significant reason. "Behold, verily, thus saith the Lord unto you: In consequence of evils and designs which do and will exist in the hearts of conspiring men in the last days, I have warned you, and forewarn you, by giving unto you this word of wisdom by revelation—" (D&C 89:4). The Lord warns that there will be "evils and designs...in the hearts of conspiring men in the last days" and that is why he revealed this health code. It doesn't take much imagination to see such conspiring men in the tobacco and alcohol industries, does it? Here are groups of men getting rich of the lives, happiness, freedom, health, and families of those who consume and often are addicted to their products. The very definition, according to the Book of Mormon, of secret combinations are those who murder to get power and gain. What about the health issues? It wasn't until over a century after the Word of Wisdom was revealed that science and society as a whole began to recognize the dangers of tobacco in particular. Medicine has also shown the benefits of avoiding alcohol, eating grains, and avoiding large quantities of meat. If this revelation were simply a product of Joseph Smith's time and environment, why has it been verified to a large extent by science only much later? Early in the Church's history, Hyrum Smith announced that "hot drinks" meant "tea and coffee." Joseph Smith validated this interpretation. Some members of the church have interpreted that further to mean that caffeine should be avoided. However, the Church officially interprets it thus: "The only official interpretation of 'hot drinks' (D&C 89:9) in the Word of Wisdom is the statement made by early Church leaders that the term 'hot drinks' means tea and coffee" (LDS Church (2006). Church Handbook of Instructions, Book 1: Stake Presidencies and Bishoprics [Salt Lake City: LDS Church], 185). Tea has been defined as the drink that contains the actual tea plant, and not to include herbal teas. The Word of Wisdom was first understood as a guideline for members of the Church "not by commandment or constraint" (D&C 89:2) It wasn't until the early 1900's that the Word of Wisdom was reinterpreted or expanded by church leaders (particularly Pres. Heber J. Grant) to be no longer simply a guideline but a commandment from God. Since then, LDS members have been expected to live the Word of Wisdom in order to participate in temple ordinances and to advance in priesthood (for the males). EDIT: Something else I forgot to mention. The revelation came, as I mentioned due to conspiring men that the Lord foresaw would exist in the last days. This leads me to believe that the principles of the Word of Wisdom are adapted for our time and place and we shouldn't expect to find them in the New Testament and perhaps some of the principles will change in a millennial day. The Word of Wisdom, in my mind, doesn't fall in the category of "never ending truth" but into the category of "this is best for you at this time." There is a fascinating Hebrew idiom associated with death, the pit and the grave. The concept is that the grave or death swallows up it's victims. "Let us swallow them up alive as the grave; and whole, as those that go down into the pit:" (Proverbs 1:12). "But if the LORD make a new thing, and the earth open her mouth, and swallow them up, with all that appertain unto them, and they go down quick into the pit..." (Num. 16:30). Isaiah uses this idiom in reverse to speak of the reversal of death. Death becomes the thing that is "swallowed up." Later, in 1 Cor. 15:54, Paul quotes Isaiah. "He will swallow up death in victory; and the Lord GOD will wipe away tears from off all faces; and the rebuke of his people shall he take away from off all the earth: for the LORD hath spoken it" (Isaiah 25:8). This is the only occurrence of a reversal of this them in the Bible. I find it interesting that it occurs several times in the Book of Mormon. "But there is a resurrection, therefore the grave hath no victory, and the sting of death is swallowed up in Christ" (Mosiah 16:8). "And since man had fallen he could not merit anything of himself; but the sufferings and death of Christ atone for their sins, through faith and repentance, and so forth; and that he breaketh the bands of death, that the grave shall have no victory, and that the sting of death should be swallowed up in the hopes of glory; and Aaron did expound all these things unto the king" (Alma 22:14). "And they did look upon shedding the blood of their brethren with the greatest abhorrence; and they never could be prevailed upon to take up arms against their brethren; and they never did look upon death with any degree of terror, for their hope and views of Christ and the resurrection; therefore, death was swallowed up to them by the victory of Christ over it" (Alma 27:28). "Know ye that ye must come to the knowledge of your fathers, and repent of all your sins and iniquities, and believe in Jesus Christ, that he is the Son of God, and that he was slain by the Jews, and by the power of the Father he hath risen again, whereby he hath gained the victory over the grave; and also in him is the sting of death swallowed up" (Mormon 7:5). This is beautiful imagery that would be most useful and beautiful to a Hebrew speaking person who understood the concept of "death swallowing up" people. In Christ, death itself is swallowed up! I appreciate this imagery first found in the Bible, and think the Book of Mormon does a wonderful job at expounding and building on that imagery. "Yea, even so he shall be led, crucified, and slain, the flesh becoming subject even unto death, the will of the Son being swallowed up in the will of the Father" (Mosiah 15:7). With this understanding of the terminology, I think Abinadi is here saying that Christ's will (to "let pass this cup" of suffering and death), was swallowed up in the Father's will that he suffer and die. In other words, Christ killed his own will in preference to the Father's will. 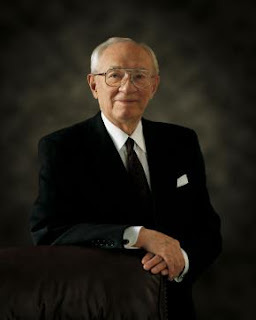 President Gordon B. Hinckley passed away this evening around 7:00 PM MST. He will be truly missed. It will undoubtedly take a day or two for the shock of this incident to pass. In my last post, I commented on the justice and mercy of God and that it is only through the mercy of God that we can be saved. In conjunction with that theme, the Book of Mormon also teaches that it is by Christ's merits alone, and not our own, that we are saved. "Wherefore, how great the importance to make these things known unto the inhabitants of the earth, that they may know that there is no flesh that can dwell in the presence of God, save it be through the merits, and mercy, and grace of the Holy Messiah, who layeth down his life according to the flesh, and taketh it again by the power of the Spirit, that he may bring to pass the resurrection of the dead, being the first that should rise" (2 Nephi 2:8). "And now, my beloved brethren, after ye have gotten into this strait and narrow path, I would ask if all is done? Behold, I say unto you, Nay; for ye have not come thus far save it were by the word of Christ with unshaken faith in him, relying wholly upon the merits of him who is mighty to save" (2 Nephi 31:19). "And I also thank my God, yea, my great God, that he hath granted unto us that we might repent of these things, and also that he hath forgiven us of those our many sins and murders which we have committed, and taken away the guilt from our hearts, through the merits of his Son" (Alma 24:10). "And if ye believe on his name ye will repent of all your sins, that thereby ye may have a remission of them through his merits" (Helaman 14:13). "And after they had been received unto baptism, and were wrought upon and cleansed by the power of the Holy Ghost, they were numbered among the people of the church of Christ; and their names were taken, that they might be remembered and nourished by the good word of God, to keep them in the right way, to keep them continually watchful unto prayer, relying alone upon the merits of Christ, who was the author and the finisher of their faith" (Moroni 6:4). These scriptures teach us that it is the merits of Christ that save us, not or own. Fallen man cannot "merit anything of himself." Even after baptism we are to rely "alone upon the merits of Christ" and not our own merits for our salvation. Truly, it is Christ and his merits that save. After Adam and Eve partook of the forbidden fruit in the Garden of Eden, God "drove out the man; and he placed at the east of the garden of Eden Cherubims, and a flaming sword which turned every way, to keep the way of the tree of life" (Genesis 3:24). What could this "flaming sword" represent? The Book of Mormon has the key. Lehi saw a vision of the tree of life (See 1 Nephi 8). He related this vision to his family. Nephi was moved by the dream and "was desirous also that [he] might see, and hear, and know of these things, by the power of the Holy Ghost" (1 Nephi 10:17). "For it came to pass after I had desired to know the things that my father had seen, and believing that the Lord was able to make them known unto me, as I sat pondering in mine heart I was caught away in the Spirit of the Lord, yea, into an exceedingly high mountain, which I never had before seen, and upon which I never had before set my foot. And the Spirit said unto me: Behold, what desirest thou? And I said: I desire to behold the things which my father saw" (1 Nephi 11:1-3). Nephi then sees, among many other things, the tree of life and its interpretation. He sees a great gulf that separates the wicked from the righteous (Compare Luke 16:26). He also sees a large and spacious building filled with wicked people. He is then told, "And the large and spacious building, which thy father saw, is vain imaginations and the pride of the children of men. And a great and a terrible gulf divideth them; yea, even the sword* of the justice of the Eternal God, and the Messiah who is the Lamb of God, of whom the Holy Ghost beareth record, from the beginning of the world until this time, and from this time henceforth and forever" (1 Nephi 12:18. *word is corrected to read sword in accordance with the original manuscript). This gulf that separates the wicked and the righteous is here referred to as "the sword of the justice of the Eternal God, and the Messiah who is the Lamb of God." This sword could very well be the same sword spoken of in Genesis 3:24. The sword is “the sword of the justice of the Eternal God” and therefore represents God's justice. Adam and Eve, being symbols for all mankind, transgressed the law of God and were therefore prohibited by justice from returning to God's presence and partaking of the tree of life. Further this sword of justice is equated directly to “a terrible gulf” (see 1 Nephi 12:18). Interestingly, Nephi later equates the gulf God's justice again and uses more imagery from Genesis 3:24—the imagery of flaming fire. "And I said unto them that it was an awful gulf, which separated the wicked from the tree of life, and also from the saints of God....And I said unto them that our father also saw that the justice of God did also divide the wicked from the righteous; and the brightness thereof was like unto the brightness of a flaming fire, which ascendeth up unto God forever and ever, and hath no end" (1 Nephi 15:28, 30). Now that man has been cast out of God's presence and justice separates man from God's presence, what is to be done? How can we cross this "gulf" that separates us from God and the tree of life? The Book of Mormon answers that question authoritatively. Lehi said to his wicked sons: "O that ye would awake; awake from a deep sleep, yea, even from the sleep of hell, and shake off the awful chains by which ye are bound, which are the chains which bind the children of men, that they are carried away captive down to the eternal gulf of misery and woe" (2 Nephi 1:13). The once wicked but now saved Ammon exclaimed: "Behold, we went forth even in wrath, with mighty threatenings to destroy his church. Oh then, why did he not consign us to an awful destruction, yea, why did he not let the sword of his justice fall upon us, and doom us to eternal despair? Oh, my soul, almost as it were, fleeth at the thought. Behold, he did not exercise his justice upon us, but in his great mercy hath brought us over that everlasting gulf of death and misery, even to the salvation of our souls" (Alma 26:18-20). "Thus we may see that the Lord is merciful unto all who will, in the sincerity of their hearts, call upon his holy name. Yea, thus we see that the gate of heaven is open unto all, even to those who will believe on the name of Jesus Christ, who is the Son of God. Yea, we see that whosoever will may lay hold upon the word of God, which is quick and powerful, which shall divide asunder all the cunning and the snares and the wiles of the devil, and lead the man of Christ in a strait and narrow course across that everlasting gulf of misery which is prepared to engulf the wicked— And land their souls, yea, their immortal souls, at the right hand of God in the kingdom of heaven, to sit down with Abraham, and Isaac, and with Jacob, and with all our holy fathers, to go no more out" (Helaman 3:27-30). "And now, my sons, remember, remember that it is upon the rock of our Redeemer, who is Christ, the Son of God, that ye must build your foundation; that when the devil shall send forth his mighty winds, yea, his shafts in the whirlwind, yea, when all his hail and his mighty storm shall beat upon you, it shall have no power over you to drag you down to the gulf of misery and endless wo, because of the rock upon which ye are built, which is a sure foundation, a foundation whereon if men build they cannot fall" (Helaman 5:12). As we can see in each of these verses, mercy is juxtaposed to justice. It is by the mercy of Jesus Christ that those who believe on his name and build on his foundation can cross that "everlasting gulf of misery" and be spared from "the sword of the justice of God." It is only after we "wake up" and realize the seriousness of the justice of God that we can be freed from the oppressive powers of Satan and hell. "And he said unto them: Behold, I, Samuel, a Lamanite, do speak the words of the Lord which he doth put into my heart; and behold he hath put it into my heart to say unto this people that the sword of justice hangeth over this people; and four hundred years pass not away save the sword of justice falleth upon this people" (Helaman 13:5). "Behold, I would tell you somewhat concerning the justice of God, and the sword of his almighty wrath, which doth hang over you except ye repent and withdraw your armies into your own lands, or the land of your possessions, which is the land of Nephi" (Alma 54:6). "And it shall come to pass, saith the Father, that the sword of my justice shall hang over them at that day; and except they repent it shall fall upon them, saith the Father, yea, even upon all the nations of the Gentiles" (3 Nephi 20:20). "And when ye shall see these sayings coming forth among you, then ye need not any longer spurn at the doings of the Lord, for the sword of his justice is in his right hand; and behold, at that day, if ye shall spurn at his doings he will cause that it shall soon overtake you" (3 Nephi 29:4). "Behold, the sword of vengeance hangeth over you; and the time soon cometh that he avengeth the blood of the saints upon you, for he will not suffer their cries any longer" (Mormon 8:41). "Wherefore, O ye Gentiles, it is wisdom in God that these things should be shown unto you, that thereby ye may repent of your sins, and suffer not that these murderous combinations shall get above you, which are built up to get power and gain—and the work, yea, even the work of destruction come upon you, yea, even the sword of the justice of the Eternal God shall fall upon you, to your overthrow and destruction if ye shall suffer these things to be" (Ether 8:23). Be it known unto all nations, kindreds, tongues, and people, unto whom this work shall come: That we, through the grace of God the Father, and our Lord Jesus Christ, have seen the plates which contain this record, which is a record of the people of Nephi, and also of the Lamanites, their brethren, and also of the people of Jared, who came from the tower of which hath been spoken. And we also know that they have been translated by the gift and power of God, for his voice hath declared it unto us; wherefore we know of a surety that the work is true. And we also testify that we have seen the engravings which are upon the plates; and they have been shown unto us by the power of God, and not of man. And we declare with words of soberness, that an angel of God came down from heaven, and he brought and laid before our eyes, that we beheld and saw the plates, and the engravings thereon; and we know that it is by the grace of God the Father, and our Lord Jesus Christ, that we beheld and bear record that these things are true. And it is marvelous in our eyes. Nevertheless, the voice of the Lord commanded us that we should bear record of it; wherefore, to be obedient unto the commandments of God, we bear testimony of these things. And we know that if we are faithful in Christ, we shall rid our garments of the blood of all men, and be found spotless before the judgment-seat of Christ, and shall dwell with him eternally in the heavens. And the honor be to the Father, and to the Son, and to the Holy Ghost, which is one God. Amen. This testimony was never denied by any of the three witness, even though all three were at one point excommunicated from the Church. Each were embittered toward Joseph Smith personally. If they had made up such a testimony, surely that would have been the best time to do so. Each testified of the truthfulness of their testimony on their death beds. Surely, if there were any time to deny it, they would have denied it then. This fact is something that the critics of the Church have to ignore or distort. They have no other choice. Here are some interesting quotes and stories from each of these men. It having been represented by one John Murphy, of Polo, Caldwell County, Mo., that I, in a conversation with him last summer, denied my testimony as one of the three witnesses to the "Book of Mormon." That I have never at any time denied that testimony or any part thereof, which has so long since been published with that Book, as one of the three witnesses. Those who know me best, well know that I have always adhered to that testimony. And that no man may be misled or doubt my present views in regard to the same, I do again affirm the truth of all my statements as then made and published. My sincere desire is that the world may be benefited by this plain and simple statement of truth. And all honor be to the Father, the Son, and the Holy Ghost, which is one God. Amen! (David Whitmer, Richmond, Mo., March 19th, 1881). I'm currently reading Claiming Christ by Robert Millet and Gerald McDermott. Millet is LDS and McDermott is an evangelical Lutheran. In chapter 7 a discussion comes up on agency's role in salvation. McDermott believes that if a person had a choice to come unto Christ, man would be a co-participator in his salvation and that such an arrangement would do damage to grace. Further, man, being totally depraved, could not choose to accept Christ. It is beyond his capacity to do so. Lastly, because of the Fall of man, it is theoretically and practically impossible for man to live without sin. God elects who will be saved and makes the first move in salvation. Therefore, salvation is by grace alone. Millet, on the other hand, insists that man is free to choose to accept the atonement of Jesus on man's behalf or to reject it. He is capable theoretically, if not practically, to live without sin. However, no man does so. Man is has received a fallen nature that is prone toward sin, but man has the power to resist sin and to choose to follow God. Since no man, excepting Jesus, has kept all of God's commandments and followed God perfectly, all need redemption through Jesus. Therefore, salvation is by grace alone. I was in a ponderous mood when I read this. Let me share some of my thoughts with you. What is a greater manifestation of grace--A) God saves man who couldn't have ever been perfect anyway or, (McDermott's evangelical view) B) God saves man who could have been perfect, but chose not to? (Millet's LDS view)? I think the second is the greater manifestation of grace and mercy. If fallen man could not ever choose of his own free-will and choice to follow God (McDermott's evangelical view), then how can God condemn man when he doesn't follow Him? Would this destroy God's justice? Since Jesus was fully man (evangelical and LDS views) and he lived a perfect life without sin (evangelical and LDS views), what would prohibit a man (theoretically) to live a perfect life without sin? I have more questions and ideas, but I think that's a good place to stop for now. I think the evangelical view as represented by McDermott does damage to God's perfect justice and mercy. On the other hand, I believe the LDS view restores these two attributes to God in their perfection. Let me say that while I believe men could, in theory, live a perfect life, I do not think that any man has ever done so (in practicality) except Jesus. In my mind, this is what is so marvelous about the gospel of Jesus Christ. Even though we have all fallen short of the glory of God, have sinned, and deserve an infinite hell, if we stop serving our will and decide to serve God's will, He will forgive us because of the merits, mercy, and grace of his Son. Since God is just, he cannot condemn a man for something he did not choose to do of his own free will. If man were totally depraved and incapable of following God, God could not condemn us because we sin. Truly God's justice and mercy are brought into perfect harmony in Jesus Christ! (Hymns of the Church of Jesus Christ of Latter-day Saints, 195). Paul tells us in Acts 17:22-29 basic nature of God and our relationship to him. Please read carefully.
" Then Paul stood in the midst of Mars’ hill, and said, Ye men of Athens, I perceive that in all things ye are too superstitious. For as I passed by, and beheld your devotions, I found an altar with this inscription, TO THE UNKNOWN GOD. Whom therefore ye ignorantly worship, him declare I unto you. God that made the world and all things therein, seeing that he is Lord of heaven and earth, dwelleth not in temples made with hands; Neither is worshipped with men’s hands, as though he needed any thing, seeing he giveth to all life, and breath, and all things; And hath made of one blood all nations of men for to dwell on all the face of the earth, and hath determined the times before appointed, and the bounds of their habitation; That they should seek the Lord, if haply they might feel after him, and find him, though he be not far from every one of us: For in him we live, and move, and have our being; as certain also of your own poets have said, For we are also his offspring. Forasmuch then as we are the offspring of God, we ought not to think that the Godhead is like unto gold, or silver, or stone, graven by art and man’s device. " Now, may I ask, Paul, why shouldn't we think of God as gold, silver, or stone, etc? What is the logic in your statement? I think Paul would say "We are God's offspring. We are, therefore, what he is. He is what we are. Therefore, we shouldn't think of him as anything else like gold, silver, or something created by man." That's what this scripture seems to say to me in very plain terms. Now, if we're the offspring of God, he cannot be anything but what we are! His logic is as clear as can be. To interpret any other way is to destroy the meaning of his logic. Further, God is not "unknown" or unknowable like the Athens thought. Many today also teach that he is unknowable, or inconceivable by nature. Does this imply that the mainstream Christian idea of God as being inconceivable or unknowable is derived from the Greek world of thought? Lastly, Paul argues that we are God's offspring (Greek: genos!) and therefore we ought not think he is like silver, or gold. What should we think of him as then? The implication is perfectly clear. If we are his genos (Latin genus, English, "species") then we ought to think that he is basically like us in his nature. We are of the same species. The Geneva Bible translates it "generation." Generation is a word derived from "genus." Genus has to do with origin usually in the sense of a child has his origin in his parent. Since this appears to be the plain and obvious meaning of the verse, could we say that Paul believed that men are gods by nature? Do you accept Paul's teaching, or do you prefer the Greek understanding of God as being "unknown" and totally other? I've always been impressed by this scripture and see it as one of the greatest Biblical evidences for the basic tenet of Mormonism, namely the nature of God and man. Latter-day Saints have long been criticized for our rejection of the post-Biblical concepts of the Trinity. One such post-Biblical concept is the idea that the Father, Son, and Holy Spirit are ontologically one Being who is three persons. In contrast, LDS believe that the the Father, Son, and Holy Ghost are three persons and three distinct beings. While mainstream/traditional Christians maintain that the three persons of the Trinity are in reality only one Being and one God, LDS Christians affirm that there are in fact three Beings who are one in glory, power, might, dominion, mind, will, knowledge, attributes, etc. In LDS thought the three persons of the Trinity are one in every conceivable way except their identity or being. Over the years some of my non-LDS Christian friends have listed a few different New Testament passages in support of their concept of the Trinity. I will here quote them and then comment on why they do not reflect post-Biblical Trinitarian notions and show how they often are more congruous with the LDS concept of the Godhead. "I and my Father are one." This verse does not say that they are "same being." This text does not say how they are one at all. Fortunately for us, John later records Jesus' teaching on how He and his Father are one. "And now I am no more in the world, but these are in the world, and I come to thee. Holy Father, keep through thine own name those whom thou hast given me, that they may be one, as (kathos) we are...Neither pray I for these alone, but for them also which shall believe on me through their word; That they all may be one; as (kathos) thou, Father, art in me, and I in thee, that they also may be one in us: that the world may believe that thou hast sent me. And the glory which thou gavest me I have given them; that they may be one, even as (kathos) we are one: I in them, and thou in me, that they may be made perfect in one; and that the world may know that thou hast sent me, and hast loved them, as thou hast loved me" (John 17:11, 20-23). Jesus here makes clear that his disciples can be one even as (kathos) He and his Father are one. The Greek kathos means just as or how (See Strong's). In other words, Jesus prayed that they may be one just as He and his Father are one. If Jesus and his Father are one being manifest in two persons, for Jesus' prayer to be fulfilled his disciples must loose their identity and become absorbed into the Trinity! Assuming that a Billion or more will be saved (just for fun)--what will that make? A "Billinity"? So how are Jesus and his Father one, according to Jesus? The key is in verse 22: "And the glory which thou gavest me I have given them; that(hina) they may be one, even as we are one." The Greek word hina translated "that" literally means in order that (See Strong's). Jesus and his Father share the same glory and are thus one. Jesus prayed that his disciples may receive Their glory in order that they may be one with Them. There is no other passage of scripture in the Bible that defines how Jesus and his Father are one. The later post-Biblical doctrine that define the Trinity as one being in three persons is not derived from the Bible but is added to it. "Believest thou not that I am in the Father, and the Father in me? the words that I speak unto you I speak not of myself: but the Father that dwelleth in me, he doeth the works. Believe me that I am in the Father, and the Father in me: or else believe me for the very works' sake." As seen above, Jesus prayed that his disciples "all may be one; as thou, Father, art in me, and I in thee," but one need not go to a different sermon of Jesus to find this. He refers to this very concept in the same sermon. In verse 20 he said, "At that day ye shall know that I am in my Father, and ye in me, and I in you" (John 14:20). If Jesus meant for us to interpret "the Father [...] dwelleth in me" and "I am in the Father, and the Father in me" as "My Father and I are the same Being," did He also intend for us to interpret "I am in my Father, and ye in me, and I in you" that we, He, and His Father are all one ontological being? This, of course, is absurd. To complicate the issue further, Jesus concludes his sermon by saying "my Father is greater than I" (John 14:28). Such talk is nonsense if He and His Father are the same being. "For in [Christ] dwelleth all the fullness of the Godhead bodily." Some have interpreted this scripture as meaning that all of the Trinity somehow dwelt in the person of Jesus in an ontological union of being as defined in the post-Biblical creeds. We'll now investigate that. First, one must understand that "Godhead" in 16th century English means "deity" or "godhood." The Greek word is theotes which means "divinity." This passage would better be rendered for our modern readers as "For in him the whole fullness of deity dwells bodily" (ESV). The scripture, therefore, is not stating that all of the members of the Trinity dwelt in Christ, but that Christ was fully and completely divine. Something else the critics overlook is the following verse. "And ye are complete in him, which is the head of all principality and power." The word translated as "complete" is the adjective form of the noun translated as "fullness" in the previous verse. For this reason, it is better translated "And you have a fullness in him..." This verse, understood this way, teaches that the fullness of divinity that was in Jesus can also be in us. This fullness was not reserved for Jesus only, but for all. Therefore, this scripture cannot be rightly interpreted to support the idea that God is three persons yet one being. The doctrine of the saints receiving a fullness of God is reflected in another scripture authored by Paul. "For this cause I bow my knees unto the Father of our Lord Jesus Christ, of whom the whole family in heaven and earth is named, that he would grant you, according to the riches of his glory, to be strengthened with might by his Spirit in the inner man; that Christ may dwell in your hearts by faith; that ye, being rooted and grounded in love, may be able to comprehend with all saints what is the breadth, and length, and depth, and height; and to know the love of Christ, which passeth knowledge, that ye might be filled with all the fulness of God." (Ephesians 3:14-19). "For there are three that bear record in heaven, the Father, the Word, and the Holy Ghost: and these three are one." This one is the most fascinating. Why? Because it is almost universally recognized as being an interpolation (addition) to scripture that wasn't actually written by the original author (See Metzger, Bruce. A Textual Commentary on the Greek New Testament, 647-649). Even if the text were authentic, which it probably is not, it does not define how the Father, Word, and Holy Ghost are one. For such a definition one must turn to John 17 which clearly shows they are not ontologically one being, but one in glory. Any other proof texts for the Trinity or comments are welcome. Thanks! In the New Testament the word "mystery" often implies a "secret rite" in the Greek (see Thayer's lexicon also here). In the Latin Vulgate, it is often translated as sacramentum from which the English word "sacrament" is derived. LDS people mean "sacrament" when we say "ordinance." The two words are really synonymous. In LDS terminology, referring to the Lord's Supper as "the Sacrament" isn't technically complete. It is "the sacrament of the Lord's supper" or "the ordinance of the Lord's supper." Baptism, confirmation, priesthood ordination, etc are all "sacraments" or "ordinances." To avoid the confusion of referring to the Lord's Super as "the sacrament," the Church translation of the scriptures into Spanish refer to la santa cena (the Holy Dinner) instead of to el sacramento (the sacrament). In many older texts and often considered the more authentic reading, 1 Cor. 2:1 says that "I, brethren, when I came to you, came not with excellency of speech or of wisdom, declaring unto you the mystery of God." Later texts changed it to "Testimony." Mystery fits better in the context. Let me show you why. For example, verse 6: "Howbeit we speak wisdom among them that are perfect (teleoi, that is, mature, or the initiated), yet not the wisdom of this world, not of the princes of the world, that come to naught. But we speak the wisdom of God in a mystery, even hidden wisdom, which God ordained before the world unto our glory..."
Then in chapter 3 he repeats this theme, saying "I, brethren, [when I was among you] could not speak unto you as unto spiritual, but as unto carnal, even as unto babes in Christ. I have fed you with milk, and not with meat (adult food): for hitherto ye were not able to bear it (that is, until now you couldn't bear it), neither yet now are ye able (and you still can't!)" (1 Cor. 3:1-2). In the next chapter, Paul writes, "Let a man so account of us, as of the ministers of Christ, and the stewards of the mysteries of God" (1 Cor. 4:1). So, It appears that Paul had in his mind two classes of Saints. The teleoi (or mature, the initiated, or "perfect") who had given to them hidden wisdom in a mystery (sacrament, ordinance, secret ritual) who could receive the adult food. The second class was those who hadn't received the hidden wisdom in a mystery because they were not yet ready. The people in Corinthians who had been members of the Church already for years fell into the second class, according to Paul's epistle to them. That's pretty fascinating. I think this topic is also hinted at by the author of Hebrews (whom I believe to be Paul). For when by reason of the time ye ought to be teachers, ye have need again that some one teach you the rudiments of the first principles of the oracles of God; and are become such as have need of milk, and not of solid food. For every one that partaketh of milk is without experience of the word of righteousness; for he is a babe. But solid food is for fullgrown men [teleoi], even those who by reason of use have their senses exercised to discern good and evil (Revised Version. Hebrews 5:12-14). Wives, submit yourselves unto your own husbands, as unto the Lord. For the husband is the head of the wife, even as Christ is the head of the church: and he is the saviour of the body. Therefore as the church is subject unto Christ, so let the wives be to their own husbands in every thing. Husbands, love your wives, even as Christ also loved the church, and gave himself for it; That he might sanctify and cleanse it with the washing of water by the word, That he might present it to himself a glorious church, not having spot, or wrinkle, or any such thing; but that it should be holy and without blemish. So ought men to love their wives as their own bodies. He that loveth his wife loveth himself. For no man ever yet hated his own flesh; but nourisheth and cherisheth it, even as the Lord the church: For we are members of his body, of his flesh, and of his bones. For this cause shall a man leave his father and mother, and shall be joined unto his wife, and they two shall be one flesh. This is a great mystery (Ephesians 5:22-32). Paul refers to marriage as a "great sacrament" and also speaks of the church as a bride without "wrinkle" or "spot" painting an image of special ceremonial wedding clothing. Anyway, this continues after the New Testament. Here's the info I've gathered so far on the topic. Please read the quotes carefully before you start saying they refer to baptism or the Eucharist (some may, indeed, but not all for reasons that will be apparent to the careful reader). I think there is some real clear indicators that the "mysteries" were often other ordinances now long lost (except to the Latter-day Saints). What may all of this mean for mainstream Christians today who often teach that all an individual needs to know to be saved is that Jesus is his or her Savior? Where are the gnosis and musterion today? A Star in the East? Another bullzeye for Joseph Smith. The King James Version (KJV) of the Bible reads "Now when Jesus was born in Bethlehem of Judaea in the days of Herod the king, behold, there came wise men from the east to Jerusalem, Saying, Where is he that is born King of the Jews? for we have seen his star in the east, and are come to worship him...When they had heard the king, they departed; and, lo, the star, which they saw in the east, went before them, till it came and stood over where the young child was" (Matthew 2:1-2,9). This star seems to appear in the east. The Book of Mormon prophet Samuel predicted this sign would happen in the New World, but with different terminology. Later, Nephi reports that the sign came to pass. "And behold, there shall a new star arise, such an one as ye never have beheld; and this also shall be a sign unto you" (Helaman 14:5). "And it came to pass also that a new star did appear, according to the word" (3 Nephi 1:21). These passages indicated that the star is to "arise" or "appear" but does not mention anything about it being in the east. "Now after Jesus was born in Bethlehem of Judea in the days of Herod the king, behold, wise men from the east came to Jerusalem, saying, 'Where is he who has been born king of the Jews? For we saw his star when it rose and have come to worship him. '...After listening to the king, they went on their way. And behold, the star that they had seen when it rose went before them until it came to rest over the place where the child was." In other words, a new star appearing "in the east" is an idiom that means "a new star arises" or comes to be. This is reflected quite well in the Book of Mormon where it is not predicted that the start will be "in the east," but that it will "arise" or "appear." This is, at worst, another example of a lucky guess on Joseph Smith's part. At best, it is another evidence for the ancient origins of the Book of Mormon. Recently I discovered that King Benjamin employs creation themes and concepts in his great sermon recorded in Mosiah 2-5. King Benjamin clearly and carefully crafted his ideas around scriptural concepts that would have been familiar to his people. The Book of Mormon is much more complex than we usually realize. Below is part of the text of Mosiah 2 with words and phrases highlighted that echo words and phrases from the Genesis account (see Genesis 1-3) such as explicit references to "the beginning," "create," "of the dust," "living souls," "breath," "day," and implicit references "mother earth," "the evil spirit," (the serpent) "command," (God's commandments given to Adam and Eve), "labor" (by the sweat of thy own brow..), "garments" (tunic), etc. 9 And these are the words which he spake and caused to be written, saying: My brethren, all ye that have assembled yourselves together, you that can hear my words which I shall speak unto you this day; for I have not commanded you to come up hither to trifle with the words which I shall speak, but that you should hearken unto me, and open your ears that ye may hear, and your hearts that ye may understand, and your minds that the mysteries of God may be unfolded to your view. 10 I have not commanded you to come up hither that ye should fear me, or that ye should think that I of myself am more than a mortal man. 11 But I am like as yourselves, subject to all manner of infirmities in body and mind; yet I have been chosen by this people, and consecrated by my father, and was suffered by the hand of the Lord that I should be a ruler and a king over this people; and have been kept and preserved by his matchless power, to serve you with all the might, mind and strength which the Lord hath granted unto me. 14 And even I, myself, have labored with mine own hands that I might serve you, and that ye should not be laden with taxes, and that there should nothing come upon you which was grievous to be borne—and of all these things which I have spoken, ye yourselves are witnesses this day. 15 Yet, my brethren, I have not done these things that I might boast, neither do I tell these things that thereby I might accuse you; but I tell you these things that ye may know that I can answer a clear conscience before God this day. 16 Behold, I say unto you that because I said unto you that I had spent my days in your service, I do not desire to boast, for I have only been in the service of God. 17 And behold, I tell you these things that ye may learn wisdom; that ye may learn that when ye are in the service of your fellow beings ye are only in the service of your God. 18 Behold, ye have called me your king; and if I, whom ye call your king, do labor to serve you, then ought not ye to labor to serve one another? 19 And behold also, if I, whom ye call your king, who has spent his days in your service, and yet has been in the service of God, do merit any thanks from you, O how you ought to thank your heavenly King! 21 I say unto you that if ye should serve him who has created you from the beginning, and is preserving you from day to day, by lending you breath, that ye may live and move and do according to your own will, and even supporting you from one moment to another—I say, if ye should serve him with all your whole souls yet ye would be unprofitable servants. 22 And behold, all that he requires of you is to keep his commandments; and he has promised you that if ye would keep his commandments ye should prosper in the land; and he never doth vary from that which he hath said; therefore, if ye do keep his commandments he doth bless you and prosper you. 23 And now, in the first place, he hath created you, and granted unto you your lives, for which ye are indebted unto him. 24 And secondly, he doth require that ye should do as he hath commanded you; for which if ye do, he doth immediately bless you; and therefore he hath paid you. And ye are still indebted unto him, and are, and will be, forever and ever; therefore, of what have ye to boast? 25 And now I ask, can ye say aught of yourselves? I answer you, Nay. Ye cannot say that ye are even as much as the dust of the earth; yet ye were created of the dust of the earth; but behold, it belongeth to him who created you. 26 And I, even I, whom ye call your king, am no better than ye yourselves are; for I am also of the dust. And ye behold that I am old, and am about to yield up this mortal frame to its mother earth. 27 Therefore, as I said unto you that I had served you, walking with a clear conscience before God, even so I at this time have caused that ye should assemble yourselves together, that I might be found blameless, and that your blood should not come upon me, when I shall stand to be judged of God of the things whereof he hath commanded me concerning you. 28 I say unto you that I have caused that ye should assemble yourselves together that I might rid my garments of your blood, at this period of time when I am about to go down to my grave, that I might go down in peace, and my immortal spirit may join the choirs above in singing the praises of a just God. 30 For even at this time, my whole frame doth tremble exceedingly while attempting to speak unto you; but the Lord God doth support me, and hath suffered me that I should speak unto you, and hath commanded me that I should declare unto you this day, that my son Mosiah is a king and a ruler over you. 31 And now, my brethren, I would that ye should do as ye have hitherto done. As ye have kept my commandments, and also the commandments of my father, and have prospered, and have been kept from falling into the hands of your enemies, even so if ye shall keep the commandments of my son, or the commandments of God which shall be delivered unto you by him, ye shall prosper in the land, and your enemies shall have no power over you. 32 But, O my people, beware lest there shall arise contentions among you, and ye list to obey the evil spirit, which was spoken of by my father Mosiah. King Benjamin then builds around this foundation and speaks about the fall, the atonement, and salvation. It is truly one of the greatest sermons ever recorded. No evidence for the Book of Mormon? One favorite criticism of the anti-Mormons is that there are no evidences for the Book of Mormon. This is simply wrong. Let me here present some evidences I compiled in this paper I wrote a few years ago. All questions regarding things of a spiritual nature can ultimately only be answered by the Spirit of God. Jesus taught, “no man knoweth…the Father, save the Son, and he to whomsoever the Son will reveal him” (Matthew 11:27). Accordingly, a person cannot come to know God except through revelation. Paul taught, “that no man can say that Jesus is the Lord, but by the Holy Ghost” (1 Corinthians 12:3). John proclaimed, “it is the Spirit that beareth witness, because the Spirit is truth” (1 John 5:6). Jesus said, “The Comforter, which is the Holy Ghost…shall teach you all things” (John 14:26). This doctrine is echoed in the Book of Mormon, “And by the power of the Holy Ghost ye may know the truth of all things” (Moroni 10:5). Simply put, it is only by the power of the Holy Ghost that anyone can come to a conviction of the existence of God, Jesus Christ, or any other spiritual thing. This, however, does not mean that logical or physical evidence for the existence of spiritual truths are useless or unnecessary, but it is always an insufficient guide without revelation from God. The Book of Mormon claims to be an ancient record that spans a history of 1000 years, written by Semitic peoples who migrated to somewhere on the American Continent c.a. 600 BCE. This group of people spoke Hebrew that evolved and was altered throughout their history (See Mormon 9:33). The Book of Mormon was written using the characters or hieroglyphics of “reformed Egyptian,” but the language was after the “learning of the Jews” (Mormon 9:32, 1 Nephi 1:2). This most likely means that the ancient authors of the book wrote in the Hebrew language using “reformed Egyptian” characters. This is not an uncommon practice in language. Even today, many foreign languages can be written using the Latin alphabet, although the langauge has its own script or alphabet. One overly simple example is the name of the Chinese city, “Hong Kong.” We can use Latin letters in place of Chinese characters although both indicate the same city and are said the same way. Moroni explained that the Book of Mormon writers used reformed Egyptian to save writing space (Mormon 9:33). Since people who spoke a form of Hebrew wrote the Book of Mormon, and recorded it in Hebrew using reformed Egyptian characters, it would be reasonable to find evidences in the translated text of Hebrew names, grammar, culture and literary styles—Hebraisms. Indeed, the many such Hebraisms appear in the English Bible due to its Hebrew background. Do Hebraisms of any kind appear in the Book of Mormon? Yes, in astounding measure. The rest of this paper will survey a few such Hebraisms found in the Book of Mormon. Hebrew writers used parallelisms very extensively. Parallelisms are “words, phrases, or sentences which correspond, compare, or contrast one with another, or are found to be in repetition one with another.” There are many kinds of Hebrew parallelisms including antithetical, climatic, alternate, synonymous, synthetic, and chiasmus. All of these kinds of Hebraic parallelisms appear in the Book of Mormon. Some parallelisms are very complex and require extremely careful writing techniques to compose. One of the most complicated forms of parallelisms is chiasmus. “Chiasmus is a term based on the Greek letter chi (x) which refers to an inverted parallelism or sequence of words or ideas in a phrase, sentence, or any larger literary unit.” A simple chiasmus could consist of four parts, i.e., A-B-B’-A’. Chiasmus can be of great length and complexity, however. In Hebrew chiasmi, the middle and ends of the structure are usually the points of emphasis. Here is a very simple example from the New Testament of a chiasmus. Here first appear the words first/last and then they appear in the inverted order of last/first. Chiasmi were first studied in depth by scholarly circles in the second half of the 19th century. Prior to that time chiasmi received very little attention and were not widely known. Even today very few people have heard of chiasmus outside of academic circles. D’) and his glory shall be seen upon thee. B) that inasmuch as ye shall keep the commandments of God ye shall prosper in the land. F) and surely did deliver them in their afflictions. H) shall be supported in their trials, and their troubles, and their afflictions, and shall be lifted up in the last day. L) Verses 6-9 describe what Alma and the sons of Mosiah were doing to destroy the Church. M) (10) I could not open my mouth, neither had I the use of my limbs. O) (16) And now, for three days and for three nights I was racked, even with the pains of a damned soul. R’) O Jesus, thou Son of God, have mercy on me, who am in the gall of bitterness, and am encircled about by the everlasting chains of death. P’) yeah, I was harrowed up by the memory of my sins no more . O’) (20) And oh, what joy, and what marvelous light I did behold; yea, my soul was filled with joy as exceeding as way my pain! N’) (22) …Yea, methought I saw, even as our Father Lehi saw, God sitting upon his throne, surrounded with numberless concourses of angels, in the attitude of singing and praising their God; yeah, and my soul did long to be there. L’) Verses 24-25 explain what Alma did to strengthen the Church and to men the damage he caused previously. I’) and the knowledge which I have is of God. retain in remembrance, as I have done, their captivity. A’) Now this is according to his word. This is a picture perfect example of a Hebraic chiasmus. The focal point in the center of the chiasmus is Jesus Christ, the Son of God. Obviously, the center of Alma’s message is Jesus Christ. This is good Hebrew poetry. There are many more examples of chiasmi in the Book of Mormon. As stated before, over three hundred have been found in the Book of Mormon. I will include here just a few more. C) therefore, he findeth himself on the left hand of God. D’) I say unto you, I would that ye should remember to retain the name written always in your hearts. A’) and also, the name by which he shall call you. Perhaps the most remarkable of any chiasmus is found in Alma’s sermon recorded in Alma 12-13. Alma refers to entering into “the rest of the Lord” four times proceeding the Chiasmus, then refers to entering into “the rest of the Lord” at its central pinnacle point, and then concludes his sermon by repeating “the rest of the Lord” four more times after the conclusion of the chiasmus. (Its form is A-A-A-A-B-C-D-E-F-G-H-I-J-A-J-I-H-G-F-E-D-C-B-A-A-A-A) Obviously, the chiasmus is used as a rhetorical device to focus the reader/listener on entering into the rest of the Lord, and how that is accomplished. Further, the chiasmus is layered; it has at least one small chiasmus in verses 2-3 built inside of the larger structure. It is very beautiful and complex. Here is an outline of the larger structure. A) (12:34) and these shall enter into my rest. B) (13:1) I would cite your minds forward to the time when the Lord God gave these commandments unto his children…after the order of his Son, to teach these things unto the people. D) were ordained after the order of his Son, in a manner that thereby the people might know in what manner to look forward to his Son for redemption. F) according to the foreknowledge of God, on account of their exceeding faith…. B’) after the order of the Son the Only Begotten of the Father, who is without beginning of days or end of years, who is full of grace, equity and true. And thus it is. Amen. A) (12) …and there were many, exceedingly great many, who were made pure and entered into the rest of the Lord their God. A) (13) …bring forth fruit meet for repentance, that ye may also enter into that rest. A) (16) …and this that they might look forward to him for a remission of their sins, that they might enter into the rest of the Lord. A) (29) …that ye may be lifted up that the last day and enter into his rest. Here is the small chiastic sub-structure found in verses 2-3. A’) And this is the manner after which they were ordained. I will list one more excellent example of a Book of Mormon chiasmus. It is found in Helaman 6:7-12. In order to form this chiasmus, the author and reader would have to have a basic understanding of Hebrew. In Hebrew names, such as Isaiah, Zedekiah, Uriah, etc the ending “iah” comes from the Hebrew term “yah.” “Yah” is a shortened version of the personal name of God, Jehovah or Yahweh, usually translated as “the LORD.” Isaiah means “The Lord has saved.” Zedekiah means “The right of the Lord.” Uriah means “The light of the Lord.” Now, here is the chiasmus. D) and they did have an exceeding plenty of gold, and of silver, and of all manner of precious metals, both in the land south and in the land north. D’) and behold, there was all manner of gold in both these lands, and of silver, and of precious ore of every kind; …. A’) …And thus the sixty and fourth year did pass away in peace. In order to compose such a chiasmus as the one above, the author must have been thoroughly acquainted with Hebrew; otherwise, the author would not have thought to equate “Zedekiah” with “the Lord.” Joseph Smith did not study Hebrew until the Kirtland Period, at least five years after the Book of Mormon was published. Keep that in mind, as we will discuss further Hebraisms in the Book of Mormon. Climatic Hebrew parallelism has also been found in the Book of Mormon. found at the end of one expression and at the beginning of the next. Climax is a form of staircase parallelism, because it demonstrates to the reader a gradual ascent through the recurrence of several identical words. Here is a simple climax found in the Bible. The pattern is basically A-A’-B-B’-C-C’-etc. The word-sets act like a staircase leading up the point of highest significance, each other point building on the previous one. Here are a few examples from the Book of Mormon. Note not only the repetition but the staircase parallelism. REDEMPTION OF MAN, which came by Jesus Christ, they are brought back into the presence of the Lord. WILL THEY NOT come unto the true fold of God? A third type of parallelism found in the Book of Mormon is called extended alternate. Its basic pattern is A-B-C-A-B-C, although it can be any length. Here is a Biblical example. C) and encamped in Gilead. C) and encamped in Mizpeh. B) of the ministry of my people. D) are for the more part of the reign of the kings. A) Behold, are ye stripped of pride? B) I say unto you, if ye are not ye are not prepared to meet God. E) and such an one hath not eternal life. A) Behold, I say, is there one among you who is not stripped of envy? Finally, there is even an example in the Book of Mormon of a complex parallelism that contains a chiasmus, extended alternate, and climax all in one place. This is found in Alma’s sermon to his son Corianton. The CAPITALS are used to denote the climax, and the bold words show the chiasmus, and the italicized words show the extended alternate. Note that some words are used for more than one parallelism. B’’) and ye shall have good rewarded you again. A’) For that which ye do send out shall return unto you again, and be restored; therefore the word restoration more fully condemneth the sinner, and justifieth him not at all. Could anything so complex be just an accident? What is the likelihood that so many complexities could all exist in the same book by accident? What do parallelisms in the Book of Mormon prove? First of all, Chiasmi were not a matter of discussion anywhere on the American continent for decades after the Book of Mormon was published. It is a fact, which has been thoroughly demonstrated, that there are more than three hundred such chiasmus in the Book of Mormon. There are other literary devices in the Book of Mormon such as climax and extended alternate. In the example of Alma 41, a climax, extended alternate and a chiasmus appear together in the very same passage! All of these types of parallelisms fit perfectly into the culture the Book of Mormon claims for itself. What is the most rational explanation? Did Joseph Smith independently discover chiasmi and other parallelisms in the Bible before he authored the Book of Mormon, and then work them into his Book of Mormon text? Did he have an understanding of Hebrew such as the meaning of “iah” as discussed above? Did you, who live in such a more enlightened age and have much more formal education than Joseph Smith, even know of such things? Obviously, Joseph Smith did not know either. Even if he did know, how could he be so brilliant as to discover these literary forms, include them in his text and yet be so foolish as to never even mention their existence as evidence for the book’s authenticity? The critics of the Book of Mormon have the difficult task of providing logically sound answers to these questions. Otherwise, there is only one plausible answer—the very existence of such parallelisms in the Book of Mormon reinforce very strongly that the Book of Mormon is exactly what it purports to be: sacred, ancient, Hebrew scripture translated by the gift and power of God through the modern day prophet Joseph Smith. That is the most rational explanation. There are many examples of Hebrew grammar usage in the Book of Mormon. Many of such examples have been edited because they reflect bad English grammar. As a result we are forced to turn to the 1830 (first edition) of the Book of Mormon in order to more fully investigate this topic. Ironically, these verses have been edited to reflect better English grammar, adding to the list of the “changes” to the Book of Mormon that the critics so often refer to. Of course, these changes themselves are strong evidence to Joseph Smith’s claim to have translated the Book of Mormon from an ancient record written according to the “learning of the Jews” (1 Nephi 1:2). Why would the critics be willing to overlook such facts? For years, critics of the Book of Mormon have mocked what the 1830 Book of Mormon says on page 351. Subsequent editions of the Book of Mormon added the word “part” behind “rent” so to make it read “the rent part” (Alma 46:19). Obviously, a person cannot write on “the rent” or wave “the rent” in the air! Critics have used this as evidence that Joseph Smith must have slipped up while composing the Book of Mormon. Ironically, once again, this grammatical “error” can be attributed directly to the Book of Mormon’s Hebraic source. Hebrew, in this instance, would use but one word, qera, which means rent. That is, a Hebrew writing/speaking person would refer to the part of his garment that was rent as qera or the rent instead of the rent part. This “error” reflects perfect Hebrew grammar and language. Later editions of the Book of Mormon have corrected it to say “the rent part” in accordance with English grammar. Here is another one of the critics’ changes that they use in an attempt to prove the Book of Mormon false but that in reality give more credibility to the Book’s claims. Also, there are very few adverbs in Hebrew. In Hebrew it is more common to produce an adverb with a preposition/noun structure. This is found throughout the Book of Mormon. At the end of the Book of Mormon there is a list of proper and personal names found in the Book of Mormon with the title “Pronouncing Guide.” A quick glance at the list of names brings up some questions. You may notice that there are no Nephite/Lamanites names that start with the letters D (“Desolation” is an English word, and “Deseret” is a Jaradite word), F, Q, V, W, X, or Y. These letters do not have corresponding sounds in Hebrew; therefore, there are no Book of Mormon names that start with those letters. If Joseph Smith were the creator of the Book of Mormon and all of the original names therein, was he just lucky in not originating any names that started with those letters? Did it happen by chance? Could it be that he already knew Hebrew and was careful not to create any new names that started with those letters? None of these explanations are likely or valid. It is much more likely that the Book of Mormon contains authentic Hebrew names, as will be shown. In order to make something an “ite” (such as Lamanite) in Hebrew, an “i” sound is added at the end of a name. We have great examples of this in the Book of Mormon. Some other examples include Limhi (Mosiah 7:9, probably from the personal name “Lamah”), Amlici (Alma 2:1), and Himni (Mosiah 27:34). All of these names are unique to the Book of Mormon. Did Joseph Smith just get lucky in using authentic Hebrew grammar when applied to names? Here are few good Hebrew names original to the Book of Mormon with their translations. Sam: “name” in reference to the name of God. Alma: Found in fifth century BC papyri from Jewish Community in Elephantine, Egypt. Abish: Corresponds to a Hebrew name found from pre-exilic times (before 587 B.C.) in the Hecht Museum in Haifa. Aha: Hebrew for “brother.” Found inscribed in Canaanite letters of the eleventh and ninth centuries B.C. Chemish: Divine name of an Ammonite god “Chemosh.” Also given as a common name and found on a seal of a man or woman currently in the Israel Museum. Himni: Appears on two Israelite seals. The first from the eighth century B.C. was found at Megiddo in the Jeqreel Valley, the second is from the first half of the seventh century B.C. Isabel: Found on a seal in the Israel Museum in Jerusalem and is probably Phoenician in origin. Jarom: Found in four Hebrew inscriptions including a seal of the seventh century B.C. found in Egypt, and three other items from the times of Lehi: a jug inscription, an ostracon, and a bulla. Josh: Appears in three of the Lachish letters from the time of Lehi. Also is one of the names of four people mentioned in a fifth-century B.C. Jewish Aramaic papyrus from Elephantine, Egypt. Luram: Found on a seal from about 720 BC during excavation at Hama in Syria. Also found on as graffiti on three bricks from the same level at Hama. Mathoni: Appears on a seventh-century B.C. wine decanter, on six seals, and on seven bullae, most of them from the time of Lehi. Muloki: Found on a bulla from Jerusalem dating from the time of Lehi. How could Joseph Smith invent these names, put them in the Book of Mormon, and then later all be vindicated by archeology and Hebrew studies? If Joseph Smith somehow had access to these things that were not yet discovered, knew Hebrew perfectly, and therefore put these names in the Book of Mormon to substantiate his fraudulent claims, why didn’t he point them out as evidence for the Book of Mormon? Joseph Smith did indeed translate these Hebrew names from the ancient text. Archeology and linguistics have come to be strong evidences of his claims. The Book of Mormon text is full of strong evidence of its ancient origins. The Book of Mormon is either (1) authentically ancient, or (2) a creation of Joseph Smith who was some sort of a linguistic literary genius with prophet-like foreknowledge that enabled him to compose chiasmus before anyone else knew of them and include undiscovered authentic Hebrew names, that would later be vindicated, in his text. If Joseph Smith was indeed so brilliant and careful and possessed such foreknowledge, then why would he be so careless as to never bring such things up as evidence for his Book? However, if the Book of Mormon is indeed an ancient record, then there is no need to try and explain all of the mounting textual evidence away. The Book of Mormon is its own greatest witness. Donald W. Parry, The Book of Mormon Text Reformatted According to Parallelistic Patterns, i. This article will not go into great detail on all of the kinds parallelisms in the Book of Mormon. I will only discuss and give examples of a few. For an overview of all the known types of parallelisms and examples of each as they are found in the Book of Mormon, see The Book of Mormon Text Reformatted According to Parallelistic Patterns by Donald W. Parry. Nils Wilhelm Lund, Chiasmus in the New Testament, vii. As a side note, Mulek, a name that is unique to the Book of Mormon, is the Hebrew diminutive of Melek. Melek means king and Mulek therefore means little king. Significantly, the Book of Mormon states that Mulek was the only surviving son of King Zedekiah. Mulek was, indeed, a little king. Joseph Smith could not have possibly derived such information from the Bible. Donald W. Parry, The Book of Mormon Text Reformatted According to Parallelistic Patterns, ixviii. I use the word “evidence” here loosely, as the term I should use is probably “proof.” I only do so because I belief that things of a spiritual nature cannot be proven or disproved by outside evidence. However, this is as close as such evidence gets to proof. Evidence of this nature would stand up in court in any other circumstance. It is absolutely certain that these names are authentically Hebrew and ancient. Here God the Father and God the Son spoke with Joseph Smith. * Is the Bible Complete and Sufficient? * No Evidence for the Book of Mormon? God has a physical body? Jesus and Satan are Brothers?